The Borg are back! Six years previously, they had attacked Earth in an attempt to assimilate the human race, and they had begun by forcibly converting Jean-Luc Picard into their mouthpiece, transforming him into a cyborg the collective dubbed Locutus. Once again they launch an attack on Earth, and once again, the Enterprise is instrumental in destroying the Borg Cube. But this time, a vessel manages to escape the destruction, and opens a portal to the past. If the Enterprise crew are to save the future, they’ll have to follow the Borg back in time, and stop their plans. This time they have to go back to 2063, 10 years after the third world war, with humanity barely recovered from that nuclear devastation, but where in a missile silo in Montana, a cantankerous scientist named Zefram Cochrane is about to usher in a whole new age. First Contact gets a 2.35:1 widescreen 1080p presentation. It looks like the same print as was used on the DVD, but it takes full advantage of the HD resolution to deliver crystal clarity and strong detail. It looks nice and filmic, although there may be enough DNR applied to diminish grain without overly effecting detail and skin tones. In terms of sets and locations, and aided by a change in the uniforms, this is the most theatrical looking of all four Next Generation movies, and you can also see the budget spent on special effects work. You have the choice between Dolby TrueHD 5.1 English, DD 5.1 German, French, Italian, and Spanish, with subtitles in these languages and Arabic, Danish, Croatian, Dutch, Norwegian, Portuguese, Finnish, and Swedish. Again, of all four movies, First Contact sounds most impressive, with a wholly immersive and well designed sound mix, a suitable level of thumping action, and one of the best music scores for a Star Trek feature, certainly the best of the Next Gen music soundtracks, helped in no small measure by Steppenwolf and Roy Orbison. But once again, another disc from this collection offers wandering audio sync when it comes to my Panasonic player, remedied temporarily by pausing or skipping back a second or two. 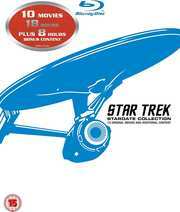 You get three commentaries on this disc, the first from director/actor Jonathan Frakes, the second from writers Brannon Braga and Ronald D. Moore, and the third created for the Blu-ray from fans Damon Lindelof (producer Star Trek 2009), and Anthony Pascale. The Library Computer is once again the fancy pop-up trivia track. There are a whole heap of featurettes on this disc, beginning with six in Production, which look at various aspects of the making of. These run to a total of 83:34 and are recycled from the DVD release, in SD. There are 3 Scene Deconstruction featurettes running to 18:20 SD. 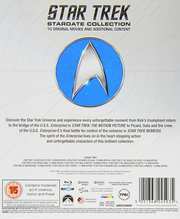 The Star Trek Universe contains 9 featurettes, 6 of them created for this Blu-ray and in HD. These run to 48:26. The 3 SD featurettes run to 51:36. You get Storyboards and a Photo Gallery in the Archives, the Teaser and Theatrical trailers in HD, and a BD Live link. One thing that is noticeable by its absence is deleted footage. This was the one time that the Next Generation cast and crew got it right. Generations was burdened with expectations, the need to pass the torch, and the fact that they killed off Captain Kirk... twice. Insurrection was a glorified TV episode, and Nemesis was just a loathsome mess. But First Contact was a movie, a real feature film, taking the Next Generation crew to the next level when it came to the stakes in the story, and in terms of the action and the visuals. The biggest villains that the Next Generation crew had faced returned, the machine like Borg, who this time get personified by a Borg Queen, a source of temptation for Data, and a target for revenge when it comes to Captain Picard. They are relentless, and almost omnipotent foes, which makes battling them more a series of last stands, than an even fight, and we get a glimpse of the stakes that crew are fighting for when the Borg open their time portal. Then there is the time travel aspect of the movie, back when Star Trek still hadn’t done time travel to death. There is the inevitable comic aspects of culture clash, and this is the one Next Generation movie that gets its sense of humour spot on, but by picking a time in the future yet to come, we get to see Star Trek history, not our own and we get an idea of where that optimistic vision of the future that Gene Roddenberry spun might just have begun. The script is tight, the action is well paced, and there’s a great balance between the lighter moments in Montana, and the fight against the Borg on the Enterprise. What’s more, Jonathan Frakes in the director’s chair is a deft hand at delivering a cinematic experience. First Contact is an entertaining, and well put together Star Trek feature film. The only nit I have to pick with it is that this is where the Next Generation ensemble feel started to be lost, and the Next Gen movies shifted into becoming the Picard and Data show. The Blu-ray presentation is solid, but not spectacular, and like all of the classic Star Trek films, it needs a new scan from the original negative.